The overall goal of DEMOWARE is to promote water reuse all over Europe by executing a highly collaborative project of demonstration and exploitation, using nine existing and one Greenfield site to stimulate innovation and improve cohesion within the evolving European water reuse sector. In order to reach this goal, the project has been structured into nine different work packages (WPs). First, technological and non-technological barriers are broken down into two separate work groups. Technological barriers including treatment processes and reuse scheme operations (WP1) and process monitoring and performance control (WP2). 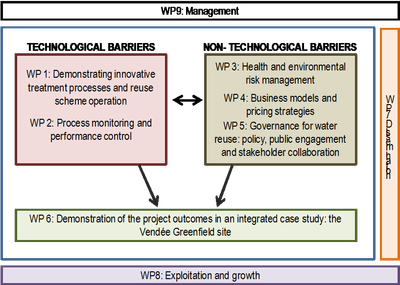 Non-technological barriers are related to risk management and environmental benefit analysis (WP3), business models and pricing strategies (WP4) and governance for water reuse (WP5). The knowledge acquired in WP1 to WP5 will be used in WP6. In this WP, water reuse will be implemented in a “new” site, for an area which requires water reuse but as of yet, there have not been any actions implemented. This WP will take into account all the knowledge gained in the previous WPs and therefore will show how this site can start to overcome the main constraints to water reuse implementation. Dissemination (WP7) and Exploitation (WP8) activities, including the establishment of a European Water Reuse Association, ensure that DEMOWARE will shape market opportunities for European providers and provide an environment for the validation and benchmarking of technologies and tools. Finally, WP9 will be dedicated to management and will aim to ensure the sound technical and financial management and coordination of the DEMOWARE project based on the organization structure and the agreed Description of Work (DOW) and in accordance with the European regulations and the consortium agreement (CA).